In certain circles I’ve been pigeonholed as a “permabear.” That is not correct. I’m probably one of the most optimistic people you will ever meet. I’m confident in the future of humanity, but I also recognize that we must overcome many challenges to get to the future we ultimately want. I am not all that enthusiastic about the future of government. In other words, I try to stay balanced. We don’t live in an either/or world. It is not the case that everything is bad or that everything is wonderful. Yes, bad things happened in 2017. Good things happened in 2017, too. Both those statements are true. You don’t have to pick one or the other. For whatever reason, we tend to tune into bad news more eagerly than we do good news. The media is partly to blame, because murders, fires, and nasty weather sell advertising; but I think something deeper is at work. Imagine this common nature documentary scene: A herd of antelopes grazes peacefully, then they suddenly sense danger – maybe there’s a lion in the grass. They freeze and prepare to flee. That behavior makes perfect sense, and we humans have an instinctive bias toward watchfulness for danger, too. We pay attention to bad news more readily than good because the consequences of ignoring bad news are higher. Overcoming this bias takes an intentional effort; and to mark the holidays, I’m going to help you do it. I ran across a great list from the Future Crunch website recently: “99 Reasons 2017 Was a Great Year.” If there’s a number in front of an item below, it came from this website. If there’s not, it came from other research, and I will provide the source. So, I’ll list some of the best things that happened this year and add my own comments. When I started researching the amount of good news that has accumulated over the last decade or so, I was blown away. I could do a series of nothing but good-news newsletters for three weeks of every month. There are a lot of great things going on. The simple fact is: The world is getting better on almost all fronts. Before we jump in, an announcement on my Strategic Investment Conference. We’re wrapping up the “early bird” registration, and the $300 discount we’ve been offering will be gone shortly. In fact, it was supposed to be gone already. I prevailed upon my partners to extend it through this weekend only because I know quite a few people are still trying to shake their schedules loose. So, you now have until Monday to register at the early bird rate. I am wrapping up negotiations with some well-known speakers, and we’ll announce them soon. I think you will want to be in the room; so don’t delay, click here for more information and to register. I read last week that there are 2,049 different types of cancer trials being run all over the world. The one I am most focused on is being conducted by a company called Bexion in Cincinnati/West Covington, Kentucky. They are engaged in a phase I trial and are seeing truly remarkable results with late-stage brain gliomas and pancreatic cancer. Essentially, the patients involved in the trial were the walking dead. The team has treated another person with a type of brain cancer for which there is not even a recognized protocol. This type of tumor is completely inoperable: You just die within a year. A thousand people a year get this type of cancer, and there are usually a number of pediatric cases. It is too soon to know the final outcome, but the person treated has gone from being mostly paralyzed on his right side to being up and walking around, and the tumor has shrunk by 59% in just a few months.. All involved are still shaking their heads. But the researchers know the mechanism of action and are ultimately hoping it works on all mass tumors. But the wheels of the FDA grind slowly, and trials take time, not to mention ungodly amounts of money. I am not even certain if Bexion’s is included among the 2,049 cancer trials I mentioned above. Disclosure: I have an investment in this private company. Right now, I think the biggest risk to my investment is not that our drug won’t work but that one of the other 2,000 companies will do the job cheaper, better, faster. Seriously, anybody investing in any type of high-tech today has to worry about that risk. 16. And on November 17 WHO announced that global deaths from tuberculosis have fallen by 37% since 2000, saving an estimated 53 million lives. You know that I’m bullish on all kinds of life-extension technologies. I really expect to live well beyond age 100 with all my faculties intact. Yet I’m also aware that in many places just living past 50 or 60 is an accomplishment. The good news is we’re making progress on the life-extension front, too. One by one, killer diseases like cholera are giving way to humanity’s fast-growing medical knowledge. Think how recently HIV was a death sentence. Now we have drugs that enable many patients to lead almost normal lives. And leprosy? I grew up hearing Sunday School lessons about this horrible disease and how society shunned its victims, ultimately leaving them to die; and now leprosy is easily treatable. Some of the greatest threats to human beings will be essentially under control within 10 years: Heart disease and arteriosclerosis will have mainstream cures; and there is reason to believe that cirrhosis of the liver will be largely cured, that the precursors to getting cirrhosis of the liver will be controlled, and the fatty liver disease that always precedes cirrhosis will not be allowed to proceed. Needless to say, if people ate better and drank less, we would get a big boost on these fronts. I could go on for dozens of pages about the medical cures that are just around the corner. And don’t even get me started on induced tissue regeneration, which is not all that far off in the grand scheme of things and has the potential to reverse your body’s aging to the point where you will be – oh, pick an age – let’s say, 25 again, but with all of the experience you have today. You just need to make sure that you make it for another 10 to 15 years. Yes, we are that close. And by the way, that means a lot of human diseases that are driven by old age are going to go away. We are going to have a great need and for an increasing number of healthcare workers over the next 20 years; but at some point in the next 30 years the need for acute healthcare and sickness medical staff is going to begin to be reduced. I know this all sounds like science-fiction; and yes, I expect that the first few thousand people treated with induced tissue regeneration will have to spend a great deal of money. But the technology is getting to the place where everything will eventually become digital, and the price will go down and down and down. At some point, society will make sure that everybody who wants it will be able to have a longer, healthier life. I’m not talking immortality – you can still get on an airplane that falls out of the sky or step in front of a London bus. Stuff happens. And, yes, I have thought a lot about how people will react when they realize they can actually be 150 years old in a youthful body that will have an extremely long health span, though not immortality. And, yes, I really have no clue how individuals and society will handle these transformations. But that is one of the things I’m looking forward to finding out. We’ll just have to live through the changes to figure them out. All these developments are wonderful news from a human standpoint, but also economically. Think of all the potential genius and innovation the world never sees because disease robs it from us. By preserving these lives, we enhance everyone’s life. I know I’ll get letters saying that life extension will add to overpopulation and the consumption of the planet’s resources. I disagree. I think the talent and ideas these additional lives give us will unleash ways to use our resources more efficiently. And, dear gods, if we can figure out how to keep people alive, then, as we’ll see below, we’ll figure out how to feed them and do other needful things. I’ve been fortunate in my life to see some of Earth’s greatest natural wonders. Our planet is a place of wonder even without humanity’s contributions. We’ve sadly destroyed some of those wonders, but in 2017 we took steps to recover them. Consider trees. All of us would die without them, but we have not always replaced those we consume. That’s changing, too, as nations and individuals set aside land for preservation and replant trees by the millions. The harvesting of trees has moved from public land in the East to private land in the West. The United States is the major supplier of wood for the United States, and all from renewable areas. We now have more 9 billion more cubic feet of trees in the US than we did in 1953! That’s 50% more than we had 60 years ago (US Agricultural Service). And the trend is not happening just in the US; Europe and other areas of the world are seeing a real upturn in the growth of forests. In 1630 roughly half of this country was forest. Today the figure is about 35%, but the bulk of that loss came during the 1800s. Since 1900 we’ve seen overall growth in forests to the point that today we have 820 million acres covered in trees. Since the turn of the century some 1.2 billion people have gained access to electricity. That’s one of the first steps out of poverty. All the modern technologies that enrich our lives and wallets need electricity to work. Gaining it is truly a life-changer. So is losing it, which many in Puerto Rico and elsewhere in the Caribbean did this year. The delays and problems in restoring the electrical grid underscore the tremendous accomplishment of making it so widely available now. It may be surprising that 12.7% of Americans live below the poverty line. Of course, we define poverty differently than much of the rest of the world does, but we still leave too many people behind through no fault of their own. Think of Appalachia and the Rust Belt – the areas that gave Trump his electoral edge last year. Much remains to be done, but I think we’ve at least noticed the problem now. That’s the first step to fixing it. And, let’s face it, many of us are blessed. I’m not sure what the poverty line was back in the 1950s, but there were years when I am sure we weren’t much above it, if we were even above it. I talk with a lot of my readers, and I hear the same thing. We know we have been blessed. The rich are also getting richer. The number of households with a net worth of $1 million (measured in 1995 dollars) grew from 2.4 million in 1983 to 10.8 million in the latest survey in 2017, far outpacing average household income growth. In 1983 fewer than 3% of households had a net worth greater than $1 million (constant 1995 dollars), but by the end of 2016 the figure was 7%. As a nation, I know we worry a great deal of worry about income and wealth inequality, but in general we are all getting better. Comment here: the cost of solar has been plummeting 20–25% a year for years now. By 2030 at the latest, we will not be building any natural gas power plants, other than in areas that receive very little solar energy. 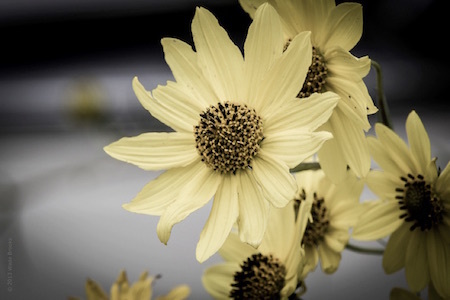 It will truly be cheaper to build plants that collect energy from the sun. There are many places in the world where this is possible now with our current technology. But with the improvements that are coming down the pike? Oh my. Something marvelous happened in the UK this year, when that country burned no coal at all on April 21st – the first such day since 1877. How is that even possible? Renewable energy sources are finally starting to show the capacity to displace fossil fuels. That doesn’t mean coal, oil, and gas will disappear in the near future. They’ll still have a place, but as parts of a bigger and cleaner energy menu. Further, the world’s biggest polluter, China, is beginning to get religion. They are recognizing the danger and discomfort of living in polluted cities and are struggling to get on top of the issue. They are shutting coal mines and planning to cut 1.3 million mining jobs. They are planning to spend $367 billion on renewable energy by 2020 and to make renewable energy 20% of China’s total energy supply by 2030. Interestingly, they now have floating solar panel farms, on a lake that covers a number of large former coal mines. I know a lot of environmentalists want the US to do more; but as we are going to see below, we are making great strides and will probably meet the goals of the Paris Accord well before any other major countries do. The really serious polluters like China and India and the rest of Asia are actually trying to catch up with us. As their pollution levels fall, the concerns about global warming will fade. Moreover, because renewable energy doesn’t need a vast transportation infrastructure, it’s enabling remote areas to join the developed world faster. We’re seeing leapfrog progress in parts of Africa, Asia, and South America. I think that progress will only accelerate from here. I like this new Saudi crown prince, Mohammed bin Salman. Not saying it’s all rainbows and ponies, but he is doing his best to pull Saudi Arabia into the 21st century. And the hand he was dealt when he took over was not exactly the best. As I wrote a few years ago, on the path they were on, Saudi would be bankrupt by 2021 or a few years afterward, at best. He is beginning to stabilize things. Good on him. Fifteen years ago we were worried about polar bears becoming extinct. There are now more polar bears than there were 10 years ago. We are almost back to where we were 20 years ago in some locations. They are not out of the woods yet (technically I guess that would be out of the ice), but there is a lot of concerted effort to make sure the world doesn’t lose its polar bears. Sometimes humanity is its own worst enemy. The things people do to each other through war, crime, or simple disrespect hold back progress for everyone. But 2017 brought some improvements. We see women and minority groups gaining new recognition and equality. Terrorism deaths and crime rates have fallen. Some endangered species have recovered. I learned something new here, by the way. I have seen numerous freshwater dolphins 1,500 miles up the Amazon. I had no idea there were dolphins in the Ganges River, but pollution and fishing had them on the verge of extinction. Now they’re coming back. What wonderful news. Generally, when we read about water, the stories are about shortages or droughts. But there is good news on this front, too. We are using roughly the same amount of water in the US as we did back in 1970, but the population has grown by almost 50%. We are producing vastly more food, generating more hydroelectric energy, and doing more of all the other things that can only be done with water. 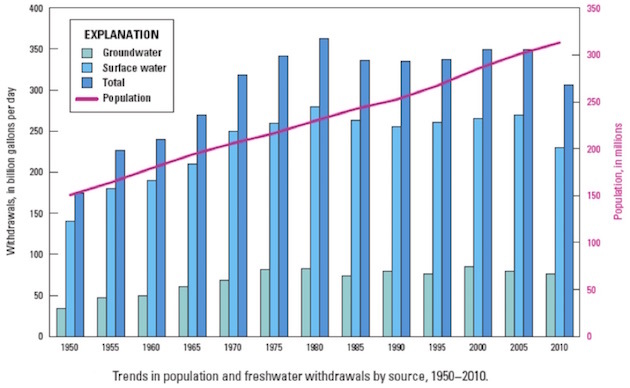 The chart below is from the USGS Water Science School. Other charts on that page indicate that the largest use of water is for the generation of thermoelectric power. And this is the trend all over the developed world: more efficient use and better conservation of water. And if you go to the EPA website, you find that carbon monoxide emissions are down 77% since 1990; lead in the air is down 99%; total nitrogen dioxide is down over 50%; particulate matter emissions are down on average about 44%; and sulfur dioxide is down 85%. And that’s just in the last 25 years. Some of us with a few gray hairs on our heads remember flying into this Los Angeles and not being able to see the city or the Valley for the smog. While climate change and other issues are controversial, I think we all can agree that we don’t want to see the air we breathe, and I personally don’t want anything in my water but a good smooth scotch. I’m for doing all we can to reduce pollution, and we are making progress. Again, you can read the full list for more good news. I might quibble with the authors on some items, as they represent government interventions that may have negative side effects, but most of the 99 items represent welcome progress. None of this means we are out of the woods. The nature of good is that bad can overcome it if we are not vigilant. We accomplished much this year, but there remains much to do, and reversing progress with regressive policies now makes no earthly sense. That’s true for both humanity broadly and those of us reading and writing these words. For those interested in further ideas, I would suggest you go to Lord Matt Ridley’s book The Rational Optimist and his latest book, The Evolution of Everything. He has a blog at www.rationaloptimist.com that I find inspirational. His latest was on a report on the oceans. I have noted in conversations that the world is generally getting better with the exception of the oceans. It is the scandal that we humans put 8 million tons of plastic into the oceans every year, with 95% of that coming from rivers in Asia and Africa. Even here there is hope for progress. In one of his latest blog posts, Matt Ridley talks about Blue Planet II, which is even more majestic than the original film. Due to regulatory progress in the developed world, many fish populations are coming back. Many whale populations are growing at a compound rate of 5% to 10% a year. Ditto for walruses. And there is so much more that is hopeful. I have run up against my limit for words in this letter, but I will add a few personal comments. Shane and I will be in Hong Kong for the Bank of America Merrill Lynch conference in the first week in January. That trip will be even more fun because Lacy Hunt and his wife JK will be there with us. We are going to take an extra day or two and be tourists. I’ve been to Hong Kong many times but have never really gotten out of the business district. The last time I was there, Peter Churchouse and his son Tama took us to lunch and then on a sailing expedition through the harbor of Hong Kong. He even let Shane and me take turns at the wheel, so we could pretend to be sailors. We have a picture to prove it! And it looks like he is going to take Shane and me and Lacy and JK out for a little time in the harbor again. I will also be hosting a small reception for my Alpha Society members in Hong Kong. Turns out there more than a few. There will be no Thoughts from the Frontline letter next week, as it would essentially get delivered on Christmas Eve. I think many of us will have more important things to do than read an economics newsletter. Typically, my forecast issues comprise at least two letters. The first one will land in your mailbox around New Year’s Eve or New Year’s Day, and then somehow I have to figure out how to write a letter while I’m in Hong Kong, while making sure that we get to do a little sightseeing as well. We get back home on the afternoon of the 9th, and I will need to spend a few days recovering from jet lag. Coming back from Asia is just really hard on me. But then the following week it all starts up again. Next year is going to be the best and the busiest for a long time. So let me wish you a happy holiday season – Happy Hanukkah or Merry Christmas or whatever your persuasion is – and extend my true best wishes for a great 2018. If you’re in the Dallas area, drop me a note, as Shane and I make multiple gallons of black-eyed peas and all the ham you can eat on New Year’s Day and serve it up between noon and five, with cornbread and the rest of the southern fixings. We love to have readers drop by. We invite all the neighbors in the building; and with my guest list, it’s a great way to meet new, interesting people and have a lot of fun. Hope to see you! And let me acknowledge that you have already given me the greatest gift you can give, and that is your attention and loyal readership. I am truly grateful and say thank you from the bottom of my heart. Dec. 18, 2017, 10:23 a.m. Your positive comments on health care gains are encouraging. However, one area where this country is struggling is the number of kids that have one type of disability or another. The percentage of kids that have something starting with A (Asthma, allergies, Autism, ADD, ADHD) is way too high and the rate of increase is alarming. Little is being done to address this situation and being able to live to 150 is the least of concerns for these kids.